Don’t take this as complaining. I love my job, but the one downfall is that I have to take vacation days to do things normal people get to do. J and I made plans a while ago to see our favorite comedian, Jim Gaffigan, perform at this year’s Laughfest in Grand Rapids. He was performing at the Ford Fieldhouse at 8 PM. A person working a regular job would have no problem working a full day and still have time to go out to dinner before the show. Since I work Friday nights, that’s not possible. So I took a vacation day. Things have changed a lot since L came along. J and I can’t just go out on a whim like we used to. Before buying tickets to the show, I had J ask her mom if she would come babysit. Luckily for us, she was excited to do so. She came on Thursday morning and since I didn’t have to work on Friday, we all decided to go out for lunch. About a week ago, I noticed a post on another blog about a new pizza place in Portage. It was the first I’ve heard of it and whenever I hear about new pizza places, I make it a point to get there as fast as I can. I wish the website was up and running because there’s a history to this place and since I’m fairly new to the area, I don’t know it, but I’m sure some longtime Southwest Michigan residents will recognize the name. 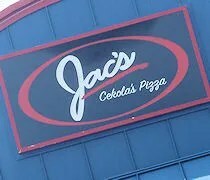 Jac’s Cekola’s Pizza is on South Westnedge in the Portage Plaze shopping center. It takes up the space next to Chocolatea that used to be Cruiser’s Pub. That placed closed in 2009 due to tax issues and it’s sat empty since. Cruiser’s closed before J and I moved here, so we have never been in the space before which means I can’t comment on how much or if it has changed. The first thing we were impressed with was the size of the space. There are two large dining rooms with plenty of extra room for dart boards, pool tables, a huge bar and, of course, 20+ TV’s. Since we had L with us, we wanted to find a booth. The first room you walk in to is actually the bar area. There are dozens of high top pub tables as well as some regular four tops mixed in. The second room is more of a dining room and this area had a few booths. We didn’t see a hostess station so we went ahead and seated ourselves. Right after we sat down, two waitresses came over. One had the menus. The other brought a high chair for us. I’m sure this is an old parenting trick, but we’ve learned if you flip the high chair upside down, the car seat fits perfectly and it really helps if I need to rock L back to sleep during lunch. I didn’t immediately see the drink menu that was set down with the menus so initially, I ordered a Coke. J and her mom also kept to the non-alcoholic drinks with a Sprite and an Iced Tea. After our waitress left, I saw the drink menu full of Michigan craft beers including Founders’ All Day IPA. In a move very unlike me, I actually tracked down our waitress and asked to change the drink order. To start things off, J and her mom decided to share a Caprese Salad. 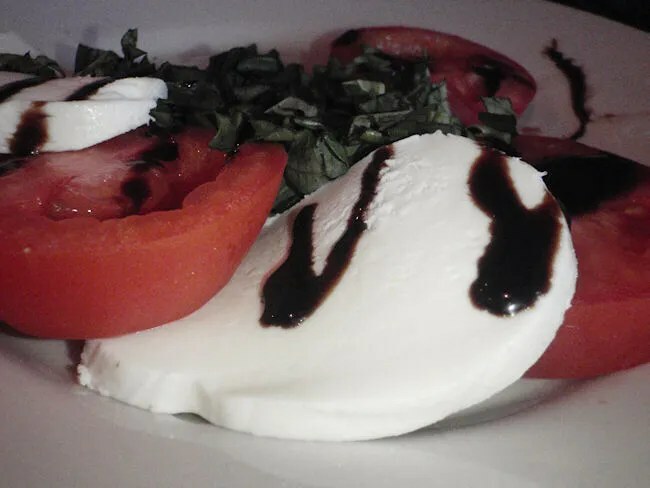 The plate came with large slices of mozzarella cheese and tomato with a pile of basil in the middle. The whole thing was dressed with Balsamic vinegar. They polished this one of pretty quickly and even J, who says she’s not a huge tomato fan, seemed to be satisfied. The star of the menu is the pizza. Again, wish I knew the history. There was one printed on the menus, so I have to believe that Cekola’s pizza has a pretty rich history in the area. The only size choice is 12″ so it’s pretty much a “everybody order their own” kind of place. J’s mom wasn’t in the pizza mood and instead picked one of the panini’s. I admit, I wasn’t paying attention when she ordered so I don’t know which one. I do know the toasty sandwich came with some delicious looking fries and she seemed very happy with her choice. J and I both ordered pizzas. J ordered a plain cheese while I ordered one with pepperoni and bacon. The pizzas are a cracker thin topped with a sweet sauce. At first glance, they are very similar to Fricano’s Pizza in size and shape. 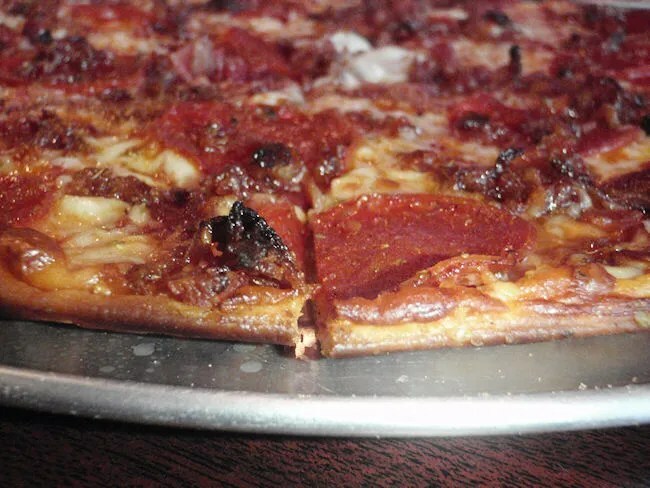 For being so thin, we were really hoping that the crust would be nice and crunchy, but it really wasn’t. It was soft and chewy and easily foldable. Even with that, this pizza was delicious. I could say the sauce could be sweeter and the crust could be crunchier, but in my opinion, that stuff didn’t even really matter. The pizza was delicious. The toppings were nice and crunchy and the pizza had a sheen of grease on top….something they are apparently proud of…and something I really like. Our bill was just under $50 for the three of. I hate to say this after just one visit, but I may have just found my new favorite pizza place. I’m a big fan of thin crust pizzas and this one is very thin. 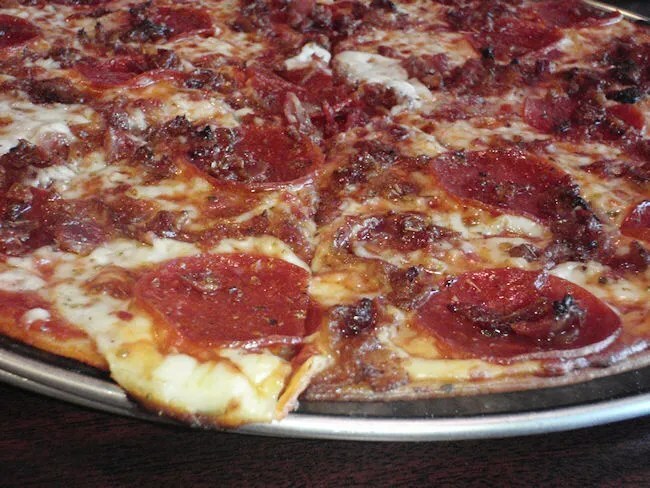 Jac’s is a welcome addition to the Kalamazoo area pizza scene. 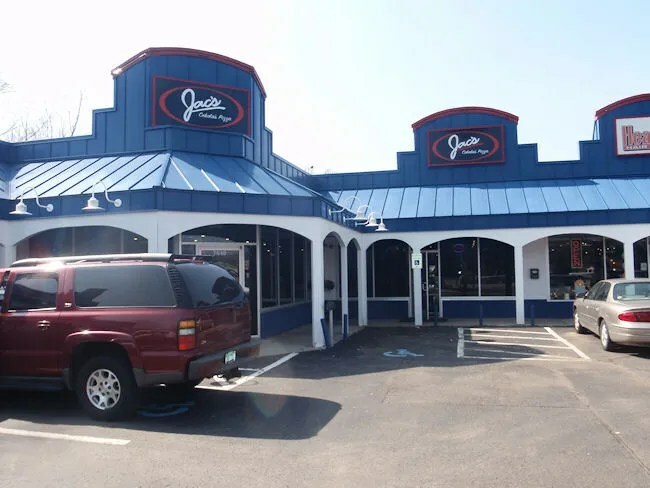 I can not wait for my second trip to Jac’s.